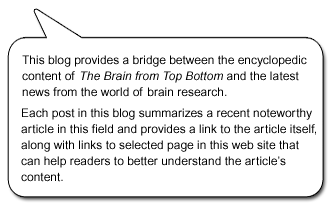 This week, as we have before in this blog, we are posting a set of links to pages on other web sites that discuss a subject covered in The Brain from Top to Bottom, along with brief descriptions of the content of those pages. The subject this week is the sub-topic “Our Evolutionary Inheritance”, under the topic “Evolution and the Brain”—an important topic indeed, for as the geneticist Theodosius Dobzhansky (1900-1975) wrote, “Nothing in biology makes sense except in the light of evolution.” And when it comes to neurobiology, that assertion is especially apt. A presentation on exobiology, the science that looks for life on other planets that are the same size as Earth and that may have conditions suitable for life to emerge. In this experimental video that condenses 4.6 billion years of the history of the universe into a single minute, vertebrates make their appearance only in the last few seconds, and human beings in a brief flash at the very end. The average number of “Friends” that people have on Facebook is about 120. This figure is roughly consistent with Dunbar’s number: the maximum number of people with whom any one person can maintain meaningful social relationships, according to British evolutionary anthropologist Robin Dunbar. But even on social media, we really exchange information with only about 10 to 25 other people. Dunbar calculated his number on the basis of human brain size and behaviour patterns in groups of non-human primates. According to Dunbar, most people’s conversations are devoted to gossip about each other and about third parties, which serves the same function as mutual grooming does in other primates. Examples of articles critiquing evolutionary psychology, and in particular the “strong” version proposing that selective pressures have caused humans to evolve specific “mental modules” to solve specific problems that were the most important for the survival of our hunter-gatherer ancestors. The fascinating story of the famous illustration “The March of Progress”, depicting human evolution as a succession of hominid figures marching in single file, and the many parodies that have been made of it. More critiques of the popular version of evolutionary psychology —in this case, of four of its basic premises. The human brain did not evolve in the overpopulated urban environments in which most people now live, and as a result, the stresses of urban living impair some of our most basic cognitive processes. To get a better understanding of the points on which they disagree, evolutionary biologists and other scientists must sometimes return to more general considerations about science, evolution, and current human affairs. This article sounds a warning about a view of human nature called creationism, which is based on faith but tries to pass itself off as a scientific theory.